Behind our brand ethos lies the key values of love and tradition. Undoubtedly, Mother's Day is an extremely significant day to us for its reverence of love and familial ties. Love deserves to be celebrated and nothing trumps a love quite like what our mothers unreservedly shower us with. This time, we mirror the affection back towards them as we strive to make this Mother's Day exceptionally memorable with Choo Yilin. In this post, we scour through treasure chests to find the perfect pair of Choo Yilin pieces for every beloved Mom. For the traditional mom, who appreciates the touch of gold. This necklace and statement open-ended ring bundle from our Jade Garden series encapsulates all the features that a mother who appreciates the traditional oriental aesthetic would approve of. 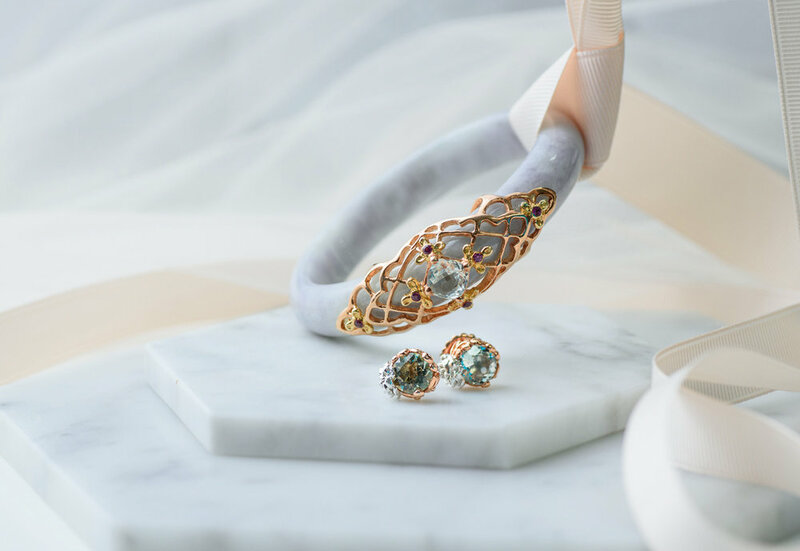 The symbolic Jade along with their Rose Gold accents and Amethyst gemstones portrays a regal yet deeply traditional quality to these pieces. Additionally, the rose gold's underlying meaning can perhaps add another touch of sincerity in this gift. While white gold represents friendship and yellow gold means fidelity, rose gold represents enduring love. Bamboo Drops and the Bamboo Vine Necklace. This one goes out to the silent yet ever supportive mothers who toil away behind the curtains for the sake of everyone else in the family. For this special someone, you know that the flashy and statement items won't cut it nor catch her fancy. In your opinion, nothing quite beats the understated beauty of the sparkle of their eyes and nothing would really illuminate your mom's charms like clean and meaningful pieces. The bamboo motifs in these pieces symbolises strength and stability despite the turmoils and incessant winds of life - a fitting piece for the one person whom you know will never falter in her love for you. The Peranakan matriarchs have an unfair stereotype of being ruthless, demanding, and one who rules with an iron first - but if you grew up in a household with one, you'll know that it's not entirely true. Their display of love and affection is just different from what others would expect. In their opinion, your well-being and being fed with the best Peranakan food you'll ever have is how they prove themselves. Our Peranakan Jade Bangle draws inspiration from the vibrant designs favoured by the lavish lifestyles of Peranakans, and each Peranakan-inspired jewellery boasts unparalleled attention to detail - much like the matriarchs themselves. Your mother loves you - and she's not afraid to show it. Now it's time to proclaim your love back to her with a piece that is sure to catch everyone's eyes. Our Cherry Blossom Necklace and Ring features all the feminine traits you could ever think of with the apt symbolisms behind the use of Jade, gemstones, and the Cherry Blossom motif - loving beyond measure, gentle as can be, and affectionate like no other. Despite the long hours of running from one place to another and managing the household - she somehow always seems to have everything under control. 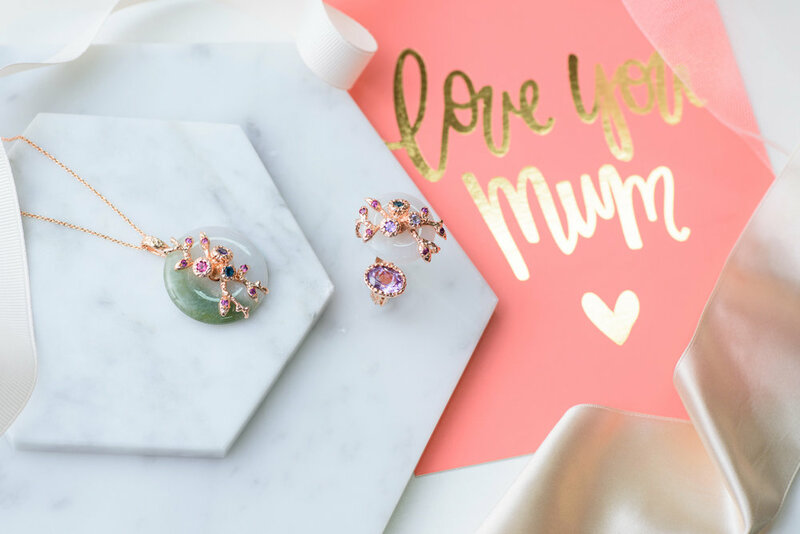 Perfecting the balancing act of being a mother, wife, and essentially the all-in-one go-to person, this is for the mother who does all these whilst looking ever poised and put together. Pearls have always been associated as symbol of class and sophistication and remains till date, one of the most romantic gifts befitting for a modern woman. Our Bamboo Pearl collection along with the meaningful symbolism behind both the pearl and bamboo motifs, is sure to charm your mom and remind her of your love.